Popular recognition program celebrates education technology tools, trendsetters and leaders. March 19, 2014 (PRLog)— WriteSteps, an evidence-based, award-winning, 100% Common Core K-5 writing and grammar program, was announced as a finalist for the fourth annual EdTech Digest Awards Recognition Program honoring tools, trendsetters and leaders in the education and technology sector. The distinguished awards program recognizes outstanding solutions—and the best and brightest minds—in education and technology. 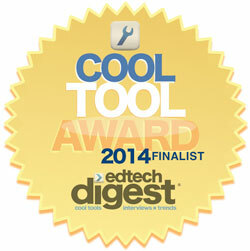 WriteSteps was nominated for the Cool Tool award, which recognizes new, emerging and established technology solutions for education. A full list of this year’s award finalists can be found at www.edtechdigest.com. Winners will be announced on March 20. EdTech Digest is a leading source of cool tools, in-depth interviews and notable trends in the education and technology space. Featuring movers and shakers in and around education dedicated to making a difference for our future generations, read it online at www.edtechdigest.com.